It’s that time of the year when I always take a look back at the year just ending here at the Trekking Centre and start thinking about the year to come. I find it helps me plan and come up with new ideas but when I look back at 2018 I am still amazed by the challenges caused by the weather. The winter was surely the most severe I have see. since I opened the trekking centre. The snow began even before Christmas and disrupted our festive rides, but our hardy riders wrapped up warmly to brave the Chase as soon as the ice melted. 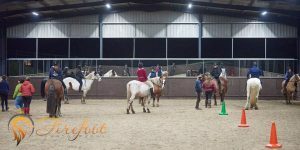 It was a massive help to have our lovely visitors’ centre and bistro so we had cosy surroundings to thaw out in – we had a snug ski lodge atmosphere with the log fire blazing – and our arena kept the horses moving when conditions were bad. 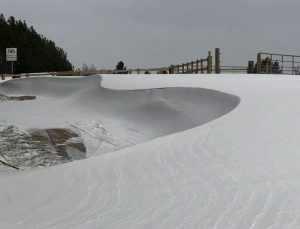 But of course worse was to come when The Beast From The East roared in with blizzards and deep drifts and hard frosts put paid to our fun for a few days. Summer was a hot challenge…. And it seemed that no sooner had the long-awaited spring arrived than we were facing another weather test. Summer came with long hot days and a record breaking drought – no rain means no grass! I ended up having to feed the herd with hay rations through most of the summer. 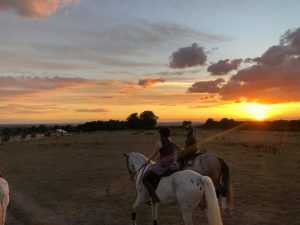 There was a consolation though – gorgeous evenings when our clients enjoyed barbecue rides and our first ridden expedition to a local Indian restaurant. Both were voted a great success and I am looking forward to doing both again in summer 2019. We had so many activities on offer through the year – children’s activity days, pony club, and home on the range. And for adults the cross country clinics taken by myself and our instructor Karen were very popular. We have had hen and stag parties, corporate days, team building days, and celebrated the Royal Wedding. All day rides with lunch back at the centre also went well and for 2019 I am hoping we can reinstate our popular pub rides. Our two-day trek with an overnight stay in Longdon was greatly enjoyed and I hope we will do that again. My saddle-less riding clinics have really captured the imagination. 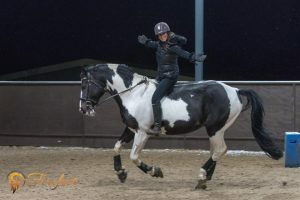 Riders are loving learning new skills and improving balance and I now have both beginners’ and experienced rider classes most weeks. the team, they looked gorgeous and behaved impeccably. 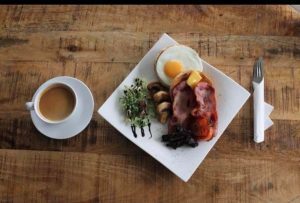 Our Bistro cooks up a recipe for success…. In the bistro we have settled on a menu that captures our ranch style, and we have many visitors now who are not riders. And we were very proud to be awarded again our five-star hygiene rating. Horses, horses and more horses…. 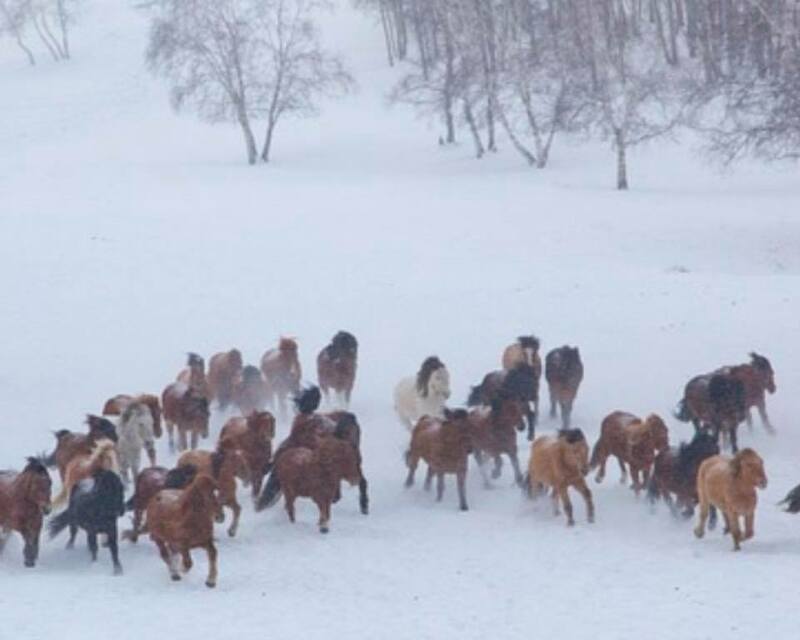 There were some sad goodbyes and warm welcomes in the horse herd. 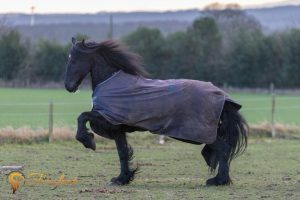 Saminca and Leo moved on to private homes and one of my most popular horses, Galaxy, started a new life in well earned retirement. Stepping in was the stunning Friesian mare Kitty. I think we have all fallen in love with this spectacular but very kind and gentle mare. Joining her later in the year was our new big boy Tyri, a dramatically marked Appaloosa cross. 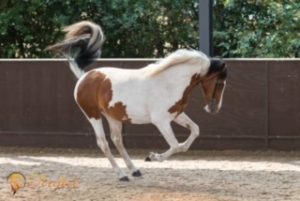 He has competed to quite a high level in dressage but he loves best to be cantering along out on the Chase. What a happy horse he has turned out to be! 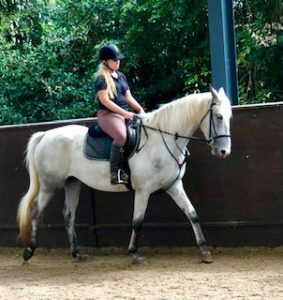 Saminca’s full bred Oldenburg daughter Sahara is proving to be an absolute delight for our experienced riders and will excel in the school I am sure. And I am so proud when I am out leading a trek to see three of our home breds trotting along behind. 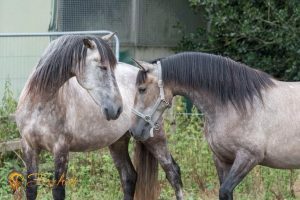 My Dutch warmblood stallion Zidane’s sons Dakota and Oregon and daughter Arizona joined the treks in 2018 and are already very popular. It won’t be long before Dakota’s full sister Indiana joins them. And 2019 will also see another new arrival available for clients. 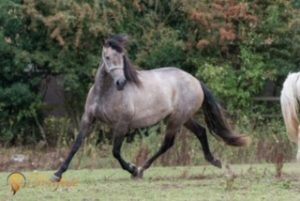 I am currently training our beautiful Andalusian mare Nymeria, full sister to my lead horse Pele, and she will be a wonderful addition to the team. The year brought us one or two health worries. Jake was out of action for a little while, Indiana had surgery for sarcoids and Lola was hurt in an accident with a gate. Zidane’s teeth bothered him again. All now have a clean bill of health but I am grateful our vets at Pool House have opened a new equine hospital. I was honoured with my partner Mark to be on the guest list when it was officially opened by Prince Charles. 2019 – an exciting year ahead…. So there we are, goodbye 2018 with all its challenges. As for 2019, I have all sorts of plans brewing! 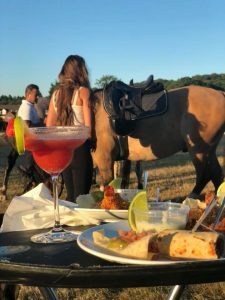 More barbecue rides, event nights, Indian restaurant rides, special kids’ activities and I am investigating possible riding holiday venues. Indiana and Nymeria will be joining the treks and Montana’s training will start. There’s a lot to look forward to, so a very happy New Year to you all!